Today I had the opportunity to detect at an old farmhouse, thanks to my good friend, Mary Shafer. So that's how I got the invitation to detect at the farmhouse. My job was to teach their son how to use his machine. Of course I accepted the invitation! I'm always excited about an opportunity to teach the ins & outs of the hobby to a new generation. When we got there, Mary introduced me to Ash. We went over the settings on the M6 - what they do and what they mean. I also explained what discrimination means. He lives at an old farmhouse, so I set his discrimination to just above iron and he was ready to begin. It only took him about two minutes until he found his first good signal. 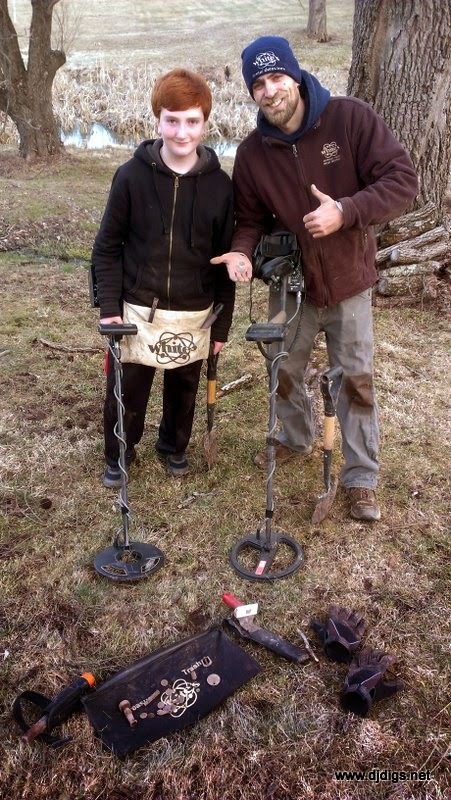 We quickly went over the proper way to dig a plug. And he was a natural! He uncovered a nice old suspender clip - fully intact. Now this is where I can tell if someone is truly into the hobby: When I told him what it was and how old it might be, his eyes lit up! He didn't think it was a boring old suspender clip at all. I could tell right then & there that he appreciates history. It's hard to find kids who appreciate the past in today's video & computer-centric society. Ash is pretty cool! He dug a few more holes. He found a few pieces of trash before he got his first coin. 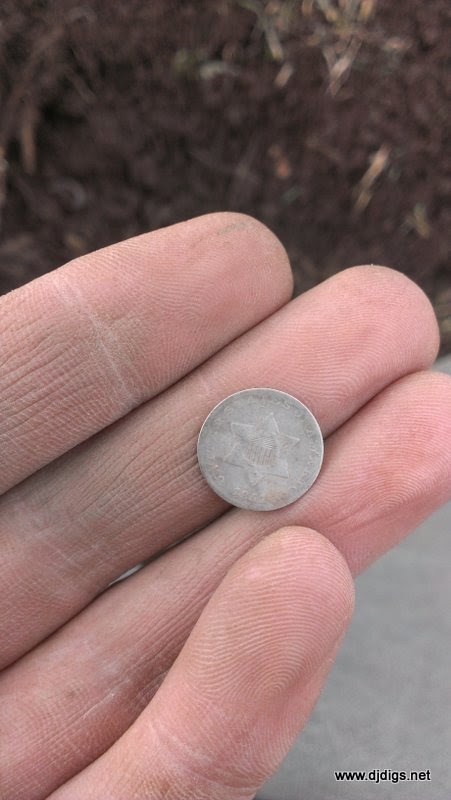 I believe it was a 2001 quarter. We went over a few more details about the hobby. Ash said he felt pretty good with his machine and he understood everything so far. So he went off on his own to see what he could come up with. It was a large property and the original outbuildings were still in one piece. The first spot I wanted to check out was the original path to & from the outhouse. 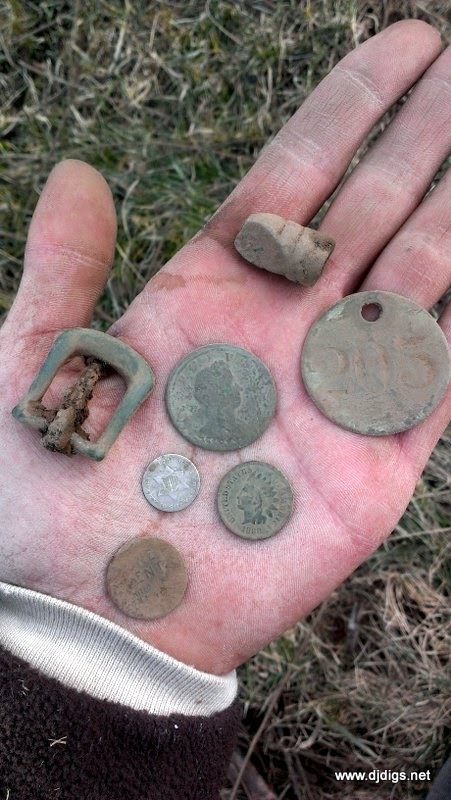 I found a few bullet casings and a modern penny or two, but I wasn't coming up with much else. I knew stuff had to be there - the property is old. So I took a step back, looked around, and tried to picture the colonial days. There was a creek about 75 feet off the front of the house, and near the creek was a giant old tree. It must've been 200 years old by the size of it. 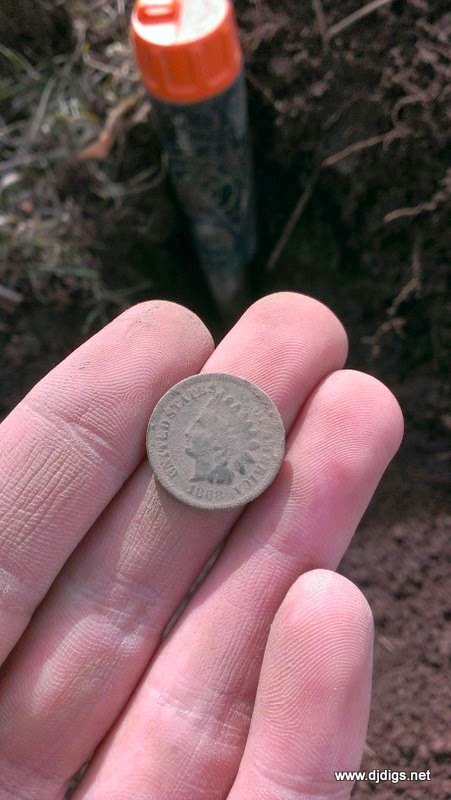 an Indian Head penny - 1868. 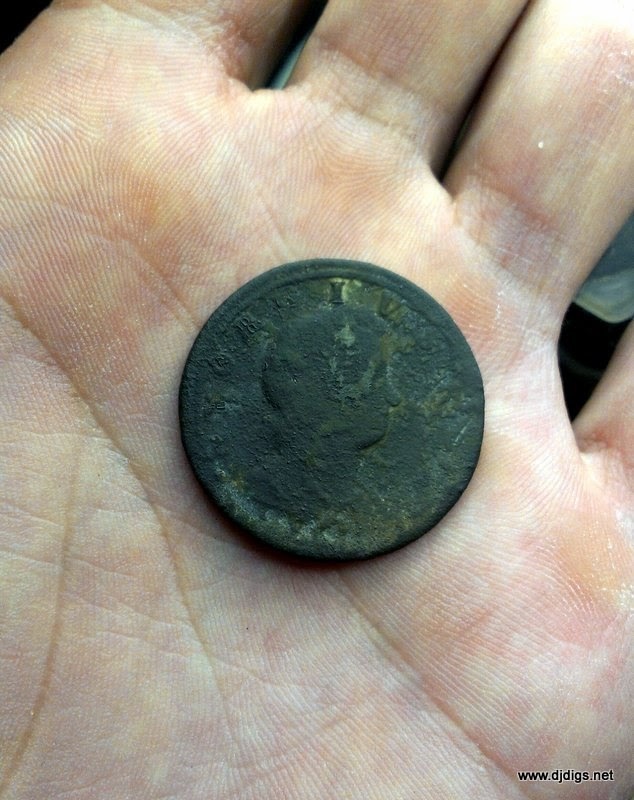 I haven't determined exactly what it is - it's either a King George or possibly a state copper. 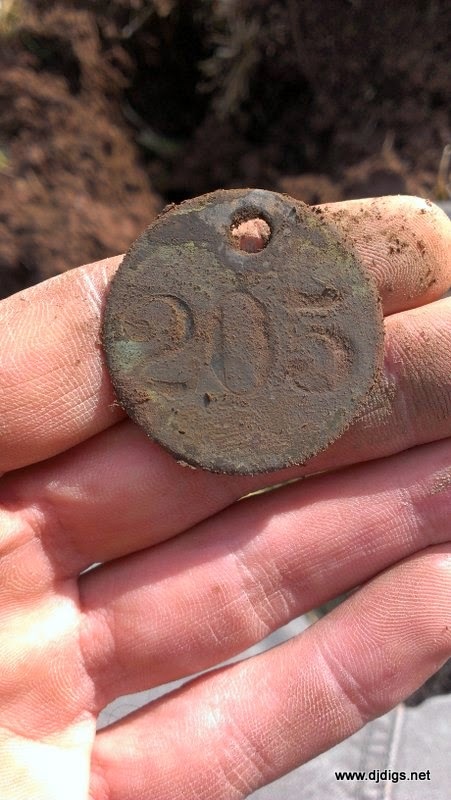 big copper tag - marked 205. A few minutes later, still working the same area near the tree, I was surprised to get a silver signal. I dug the hole and saw a tiny shiny disk, covered in mud. I've been fooled many times before by little play coins, and I really thought that's what this was. I ran halfway across the field screaming Mary's name - I was so excited. 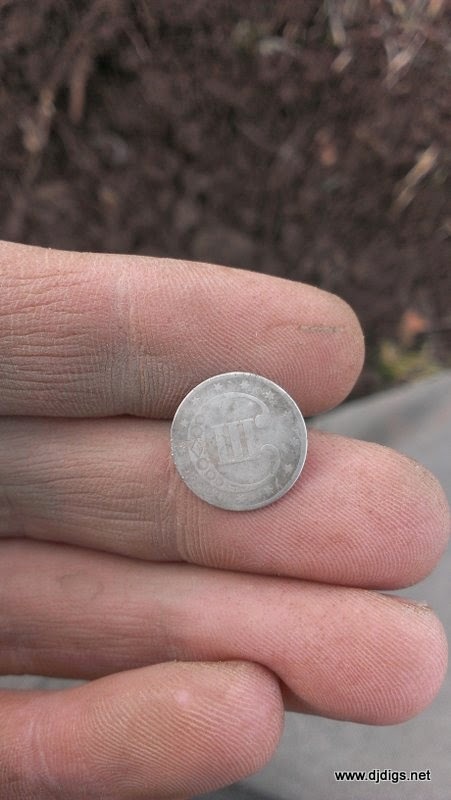 I found my first ever silver 3-cent piece! She was thrilled for me, too. I told her to come search the area by the tree. By then, I was more than happy with how the afternoon went and it was starting to get close to our time limit. We had to get going - it was a school night for Ash. 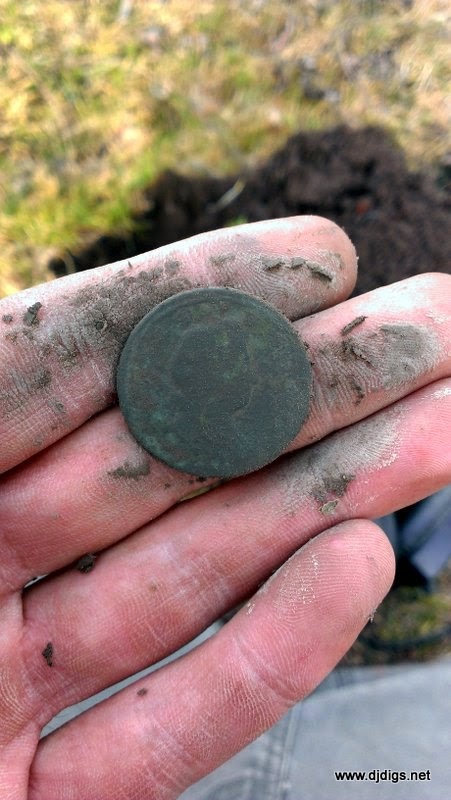 So I did a fast paced search of the immediate yard and I came up with a bunch of clad, a wheat penny, and a nice old buckle. The buckle is intact and has a beautiful green patina. 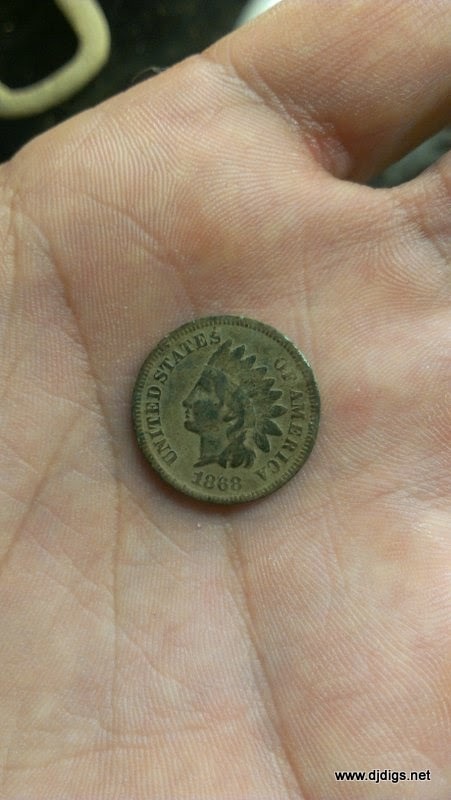 I would love to know exactly how old it is. Can anyone date this buckle? What an amazing day this hunt turned out to be! I went along to help out a kid getting into the hobby, and I left with more than I ever could have expected. It was nice meeting Ash and his family. I'm grateful for the whole opportunity. Once again fate stepped in. If it wasn't for Ash needing help with his White's machine, I never would have been invited and I wouldn't have been able to find these pieces of history. Total finds - Great day!